~ for my real and imagined readers to enjoy, discuss, contemplate and share. To be honest, I didn’t enjoy this film very much. It was the company of my friends which lured me into the cinema seat and in front of a screen playing this horror-romance-vampire-basedonaSwedish-film. WARNING- May be some spoilers. A vampire girl and a weird (really weird) boy meet when vampire girl and her guardian move in to the neighbouring apartment. She warns him not to fall in love with her. The boy is 12 years old, but vampire girl has been living for much longer as vampires tend to do. Guardian of vampire girl hunts people and murders them at night before draining their blood and feeding his little monster. 12 year old boy, Owen, suspects something is up and eventually finds out the truth. But love is blind, and he chooses to run away with vampire-girl. Owen has also been subjected to extreme bullying by other boys in his grade. Mental and physical abuse which escalates when he tries to fight back. 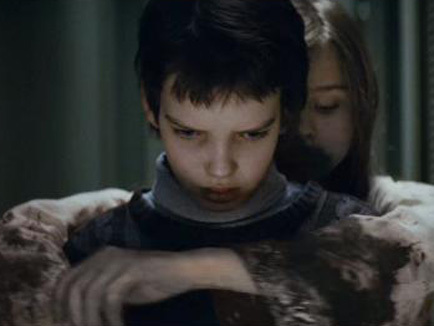 One of the most brutal scenes in the film – there are a lot of gruesome gory moments – was the final bullying sequence. Throughout the film I would routinely cover my eyes and wait for my friend to nudge me so I could look again. But during this scene where Owen is cornered, trapped, beaten and almost drowned, I couldn’t help but block my ears as well. It was the only scene to ignite true horror and disgust at the base and predatory behaviour of the bullies. Interesting side-note: The mother’s face is never seen in the film. There are always shots of her out of focus, or close-ups on the back of her head and hands. Is this so we don’t feel a personal attachment to this character? It seemed like a technique blaring out *I am using this filmic-technique to distance you from this character. See? * It was just a bit too obvious. skippingstones on Ideas are bubbling away. Ratz on Ideas are bubbling away.